Posted December 5th, 2015 by Rhys & filed under opinion. When I first read The Hunger Games trilogy, back in 2011, the Arab Springs were in full force. All over the middle east, a revolutionary wave of protests and demonstrations were lead against many dictatorships and cruel regimes. We’re still seeing the after effects of these clashes; Syria is overrun in a civil war between Assad and rebel fighters whilst Daesh (ISIS) creeps in; Egypt remains in a state of unrest. Though the Arab Springs happened in 2011, we’re still seeing the means of rebellions against oppression. It’s bloody, dirty and costs many lives. 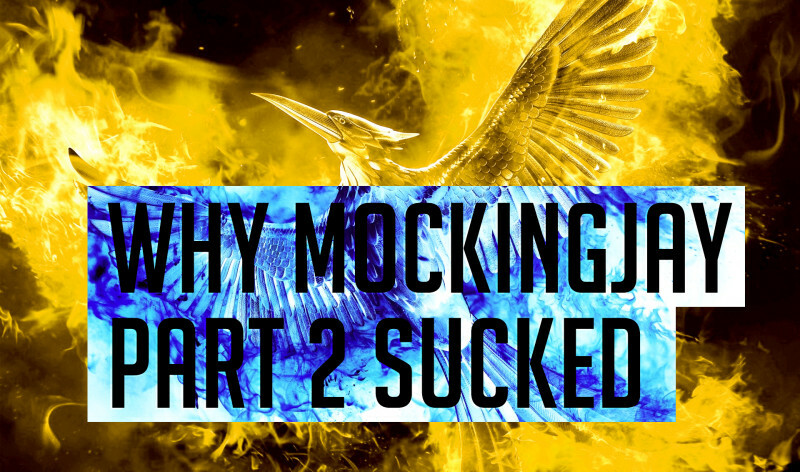 So when Mockingjay Part 2 landed as a relatively close adaptation of the novel, it just wasn’t going to cut the mustard. If you’ve seen it, you’ll know that a rebellion force marches on the Capitol, and that in its wake, Katniss, Peeta, Finnick and various others are shooting a ‘propo’ video to motivate the front lines and Districts. The Capitol has, it seems, decided that the best way to combat these rebel forces is by setting up traps known as “pods” to kill and slow them down. In one, a square of residences is elaborately filled with black oil-like liquid to drown the propo team; another sees Katniss and the gang chased by weird albino zombies in the sewers beneath the Capitol. What unites all of them, though, is the sheer hilarity of these things: it’s such an unrealistic representation of what these rebellions are really like. And we know; because the Arab Springs and conflict in the Middle East has proved to us that war is messy, brutal and deadly. Eventually, of course, Katniss manages to break away from the group and attempts to hunt down President Snow himself. Yet on her journey to the very gates of his mansion, we never see any signs of District 13 and the Rebels; there’s a few explosions, yes, but no real conflict. We never really see hand-to-hand combat, or snipers, or “boots on the ground”. This is what makes Mockingjay Part 2 the anticlimactic end to the series. Its hilariously inaccurate depiction of what civil unrest and rebellion really looks like is embarrassing and frankly an insult to all those people living in places where such conflict exists. And yes, I know it’s a fictional film; but it operates in the real world. And this was one step too many. I found myself in the unlikely position of hoping that Francis Lawrence and his team would be deviating from the novel: instead, they stuck with the text at the worst possible moment. I’m frustrated: because the series so far has been a brilliant piece of film-making, from Director Gary Ross’ first Hunger Games to Francis Lawrence’s brilliant Catching Fire and the tense Mockingjay Part 1. But thanks to Part 2’s universally disappointing story, the series has been tainted. Have you seen Mockingjay Part 2 yet? What did you think?